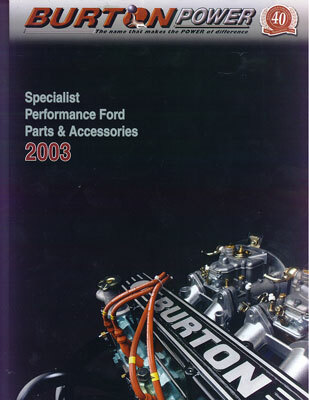 Burton Power, 617-631 Eastern Avenue, Ilford, Essex, IG2 6PN, UK publishes this 99 page softcover 8.25 inch x 11 inch catalog, full of parts and accessories for Lotus Twin Cam engines and most other European Ford engines, induction & fuel systems, cooling, filtration, exhaust and ignition systems, eletrical and instrumentation, transmissions, brakes, suspension & steering, and other accessories for small Fords. A very complete catalog, it also includes some short tech articles of interest. This brochure is new, and available for the asking. You can visit their website (Use Internet Explorer...) at http://www.burtonpower.com and make the request on line.